Sieve besan and keep in a bowl. Grind ginger and green chillies. Grease the reverse side of a few thalis or marble table top with a little oil. Make buttermilk with yogurt and half a cup of water. Mix the besan with ginger-green chilli paste, salt, turmeric powder, lemon juice and buttermilk, taking care that no lumps remain. Cook this mixture, stirring continuously, in a thick bottomed pan till it becomes a smooth thick batter. It takes a little time to get ready. Quickly spread portions of the mixture over the greased inverted thalis or marble table top as thinly as possible while the batter is still hot. When cool, cut into strips two inches wide and roll them tightly. Heat two tablespoons of oil and add a pinch of asafoetida and mustard seeds. When they splutter, pour over the pieces. 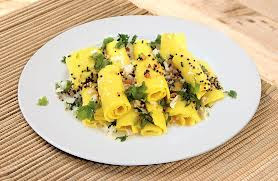 Serve garnished with scraped coconut and chopped coriander leaves.